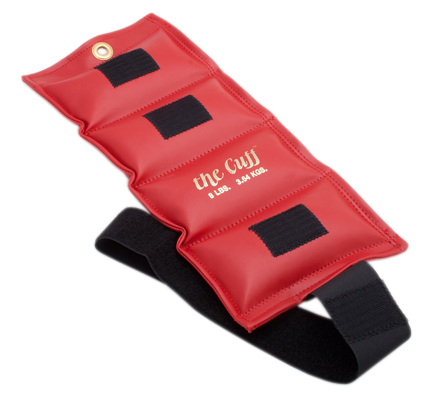 The Cuff® rehabilitation wrist and ankle weight has been proven effective in hospitals for over 30 years. It contours to snuggly fit the ankle, wrist, and even thigh. Its long closure strap assures a secure and comfortable fit even during the most strenuous exercise program. It features heavy-duty materials and double-stitching throughout. The Cuff® exercise weights are color-coded, marked with both pounds and kilograms and have grommets for hanging on any peg-board weight rack. Available from .025 to 25 pounds (0.125 to 12.5 kilograms) sold individually or in sets. Heavy-duty steel rack helps keep the Cuff® wrist and ankle weights and accessories organized. The double-sided pegboard and tray holds up to 500 pounds. 3-inch wheels allow rack to be easily moved (even over carpet). Assembly required; assembled rack measures 24" x 35" x 48". Ships UPS. Dimensions: 6" x 48" x 24"
The Cuff® Original Ankle and Wrist Weight (0.25 lb, White) has been proven effective in hospitals for over 30 years. It contours to snuggly fit the ankle, wrist, and even thigh. Its long closure strap assures a secure and comfortable fit even during the most strenuous exercise program. It features heavy-duty materials and double-stitching throughout. The Cuff® exercise weights are color-coded, marked with both pounds and kilograms and have grommets for hanging on any peg-board weight rack. Available from ¼ to 25 pounds, individually or in sets. 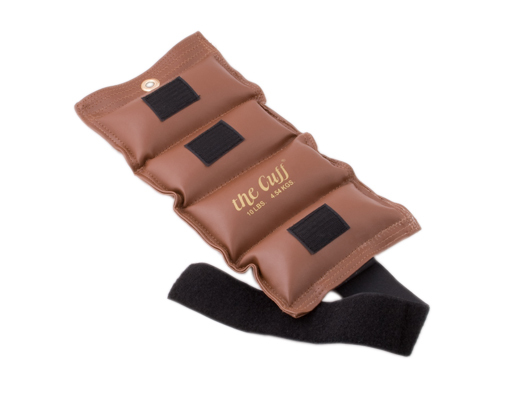 The Cuff® Original Ankle and Wrist Weight (0.5 lb, Walnut) has been proven effective in hospitals for over 30 years. It contours to snuggly fit the ankle, wrist, and even thigh. Its long closure strap assures a secure and comfortable fit even during the most strenuous exercise program. It features heavy-duty materials and double-stitching throughout. The Cuff® exercise weights are color-coded, marked with both pounds and kilograms and have grommets for hanging on any peg-board weight rack. Available from ¼ to 25 pounds, individually or in sets. 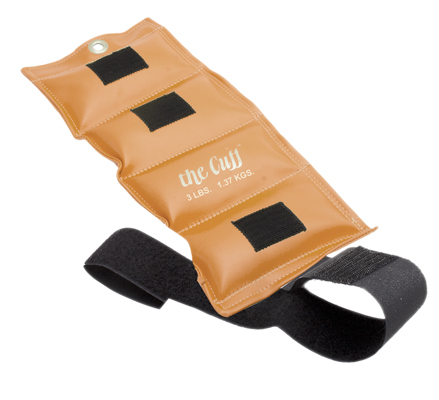 The Cuff® Original Ankle and Wrist Weight (0.75 lb, Orange) has been proven effective in hospitals for over 30 years. It contours to snuggly fit the ankle, wrist, and even thigh. Its long closure strap assures a secure and comfortable fit even during the most strenuous exercise program. It features heavy-duty materials and double-stitching throughout. The Cuff® exercise weights are color-coded, marked with both pounds and kilograms and have grommets for hanging on any peg-board weight rack. Available from ¼ to 25 pounds, individually or in sets. 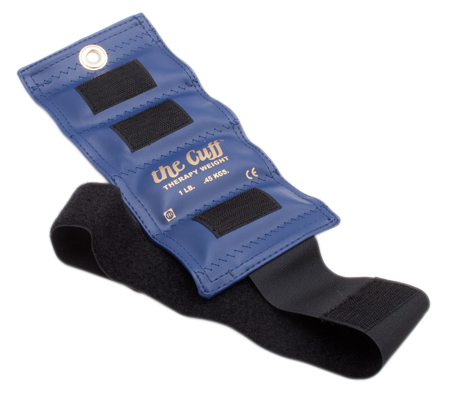 The Cuff® Original Ankle and Wrist Weight (1 lb, Blue) has been proven effective in hospitals for over 30 years. It contours to snuggly fit the ankle, wrist, and even thigh. Its long closure strap assures a secure and comfortable fit even during the most strenuous exercise program. It features heavy-duty materials and double-stitching throughout. 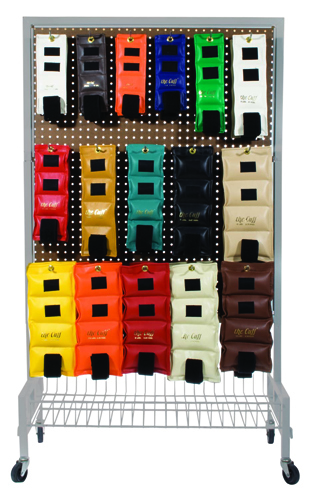 The Cuff® exercise weights are color-coded, marked with both pounds and kilograms and have grommets for hanging on any peg-board weight rack. Available from ¼ to 25 pounds, individually or in sets. 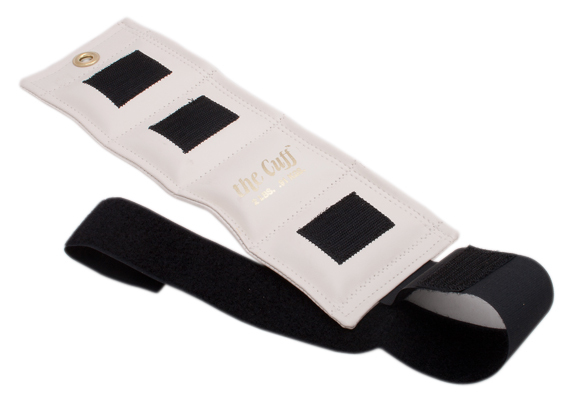 The Cuff® Original Ankle and Wrist Weight (2 lb, White) has been proven effective in hospitals for over 30 years. It contours to snuggly fit the ankle, wrist, and even thigh. Its long closure strap assures a secure and comfortable fit even during the most strenuous exercise program. It features heavy-duty materials and double-stitching throughout. The Cuff® exercise weights are color-coded, marked with both pounds and kilograms and have grommets for hanging on any peg-board weight rack. Available from ¼ to 25 pounds, individually or in sets. 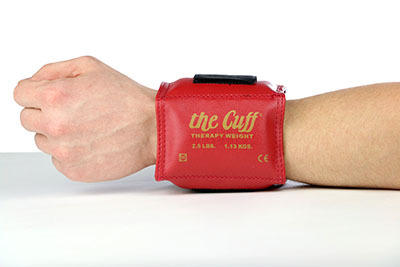 Dimensions: 12" x 0.5" x 4.25"
The Cuff® Original Ankle and Wrist Weight (2.5 lb, Red) has been proven effective in hospitals for over 30 years. It contours to snuggly fit the ankle, wrist, and even thigh. Its long closure strap assures a secure and comfortable fit even during the most strenuous exercise program. It features heavy-duty materials and double-stitching throughout. The Cuff® exercise weights are color-coded, marked with both pounds and kilograms and have grommets for hanging on any peg-board weight rack. Available from ¼ to 25 pounds, individually or in sets. 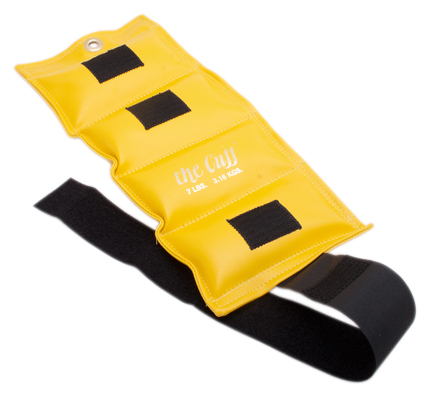 The Cuff® Original Ankle and Wrist Weight (3 lb, Gold) has been proven effective in hospitals for over 30 years. It contours to snuggly fit the ankle, wrist, and even thigh. Its long closure strap assures a secure and comfortable fit even during the most strenuous exercise program. It features heavy-duty materials and double-stitching throughout. The Cuff® exercise weights are color-coded, marked with both pounds and kilograms and have grommets for hanging on any peg-board weight rack. Available from ¼ to 25 pounds, individually or in sets. The Cuff® Original Ankle and Wrist Weight (4 lb, Turquoise) has been proven effective in hospitals for over 30 years. It contours to snuggly fit the ankle, wrist, and even thigh. Its long closure strap assures a secure and comfortable fit even during the most strenuous exercise program. It features heavy-duty materials and double-stitching throughout. The Cuff® exercise weights are color-coded, marked with both pounds and kilograms and have grommets for hanging on any peg-board weight rack. Available from ¼ to 25 pounds, individually or in sets. Dimensions: 14.5" x 0.5" x 4.75"
The Cuff® Original Ankle and Wrist Weight (5 lb, Black) has been proven effective in hospitals for over 30 years. It contours to snuggly fit the ankle, wrist, and even thigh. Its long closure strap assures a secure and comfortable fit even during the most strenuous exercise program. It features heavy-duty materials and double-stitching throughout. 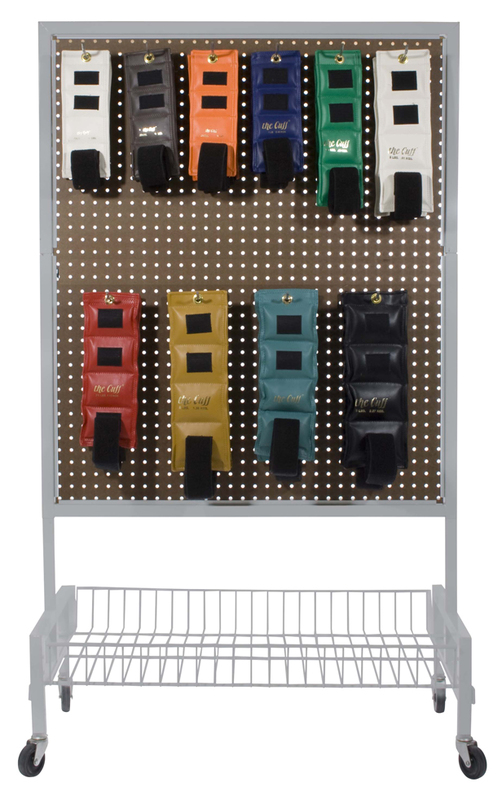 The Cuff® exercise weights are color-coded, marked with both pounds and kilograms and have grommets for hanging on any peg-board weight rack. Available from ¼ to 25 pounds, individually or in sets. 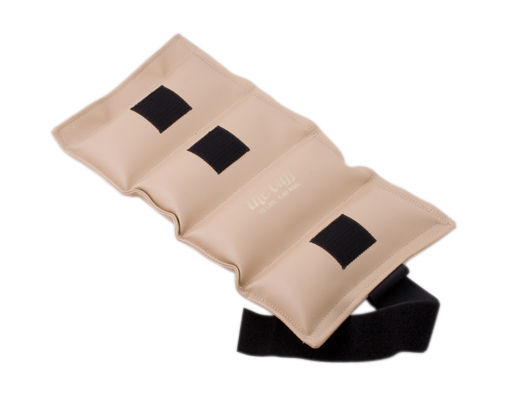 The Cuff® Original Ankle and Wrist Weight (6 lb, Beige) has been proven effective in hospitals for over 30 years. It contours to snuggly fit the ankle, wrist, and even thigh. Its long closure strap assures a secure and comfortable fit even during the most strenuous exercise program. It features heavy-duty materials and double-stitching throughout. The Cuff® exercise weights are color-coded, marked with both pounds and kilograms and have grommets for hanging on any peg-board weight rack. Available from ¼ to 25 pounds, individually or in sets. Dimensions: 14.5" x 0.75" x 4.75"
The Cuff® Original Ankle and Wrist Weight (7.5 lb, Orange) has been proven effective in hospitals for over 30 years. It contours to snuggly fit the ankle, wrist, and even thigh. Its long closure strap assures a secure and comfortable fit even during the most strenuous exercise program. It features heavy-duty materials and double-stitching throughout. The Cuff® exercise weights are color-coded, marked with both pounds and kilograms and have grommets for hanging on any peg-board weight rack. Available from ¼ to 25 pounds, individually or in sets. Dimensions: 16" x 0.75" x 5"
The Cuff® Original Ankle and Wrist Weight (8 lb, Red) has been proven effective in hospitals for over 30 years. It contours to snuggly fit the ankle, wrist, and even thigh. Its long closure strap assures a secure and comfortable fit even during the most strenuous exercise program. It features heavy-duty materials and double-stitching throughout. The Cuff® exercise weights are color-coded, marked with both pounds and kilograms and have grommets for hanging on any peg-board weight rack. Available from ¼ to 25 pounds, individually or in sets. Dimensions: 16" x 1" x 5"
The Cuff® Original Ankle and Wrist Weight (9 lb, Parchment) has been proven effective in hospitals for over 30 years. It contours to snuggly fit the ankle, wrist, and even thigh. Its long closure strap assures a secure and comfortable fit even during the most strenuous exercise program. It features heavy-duty materials and double-stitching throughout. The Cuff® exercise weights are color-coded, marked with both pounds and kilograms and have grommets for hanging on any peg-board weight rack. Available from ¼ to 25 pounds, individually or in sets. 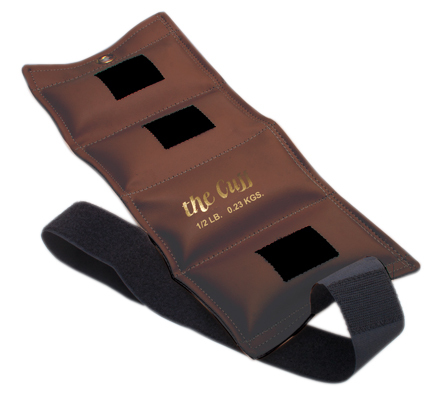 The Cuff® Original Ankle and Wrist Weight (10 lb, Brown) has been proven effective in hospitals for over 30 years. It contours to snuggly fit the ankle, wrist, and even thigh. 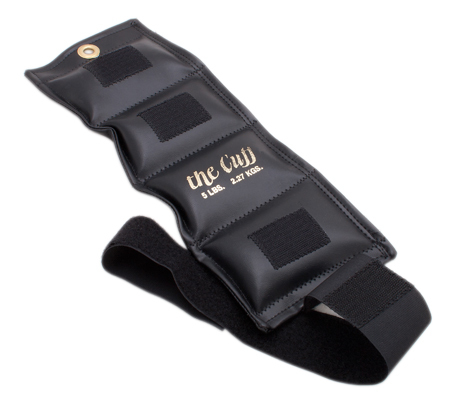 Its long closure strap assures a secure and comfortable fit even during the most strenuous exercise program. It features heavy-duty materials and double-stitching throughout. 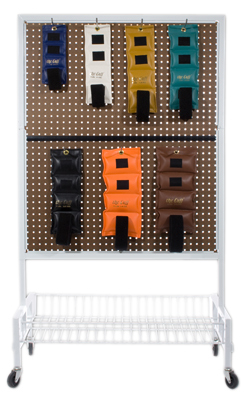 The Cuff® exercise weights are color-coded, marked with both pounds and kilograms and have grommets for hanging on any peg-board weight rack. Available from ¼ to 25 pounds, individually or in sets. Dimensions: 16" x 1" x 5.5"
The Cuff® Original Ankle and Wrist Weight (12.5 lb, Olive) has been proven effective in hospitals for over 30 years. It contours to snuggly fit the ankle, wrist, and even thigh. Its long closure strap assures a secure and comfortable fit even during the most strenuous exercise program. It features heavy-duty materials and double-stitching throughout. The Cuff® exercise weights are color-coded, marked with both pounds and kilograms and have grommets for hanging on any peg-board weight rack. Available from ¼ to 25 pounds, individually or in sets. Dimensions: 18" x 1" x 5.5"
The Cuff® Original Ankle and Wrist Weight (15 lb, Tan) has been proven effective in hospitals for over 30 years. It contours to snuggly fit the ankle, wrist, and even thigh. Its long closure strap assures a secure and comfortable fit even during the most strenuous exercise program. It features heavy-duty materials and double-stitching throughout. The Cuff® exercise weights are color-coded, marked with both pounds and kilograms and have grommets for hanging on any peg-board weight rack. Available from ¼ to 25 pounds, individually or in sets. 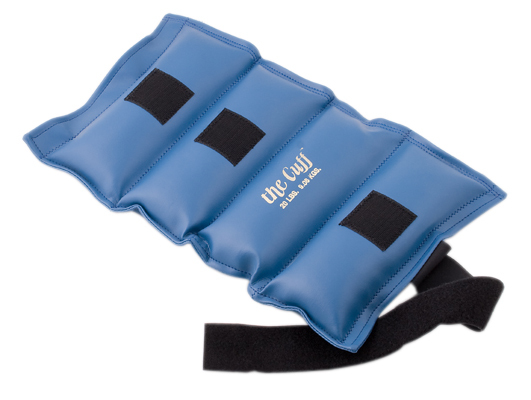 Dimensions: 18" x 1" x 6"
The Cuff® Original Ankle and Wrist Weight (20 lb, Blue) has been proven effective in hospitals for over 30 years. It contours to snuggly fit the ankle, wrist, and even thigh. Its long closure strap assures a secure and comfortable fit even during the most strenuous exercise program. It features heavy-duty materials and double-stitching throughout. The Cuff® exercise weights are color-coded, marked with both pounds and kilograms and have grommets for hanging on any peg-board weight rack. Available from ¼ to 25 pounds, individually or in sets. 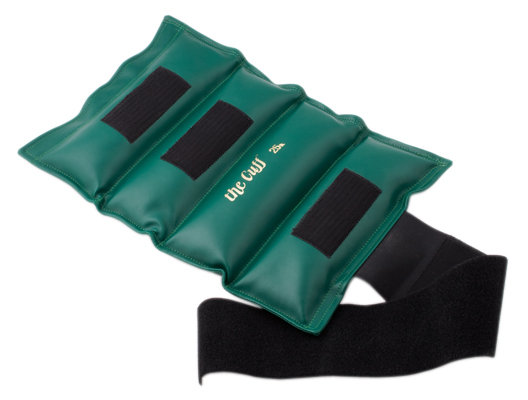 The Cuff® Original Ankle and Wrist Weight (25 lb, Green) has been proven effective in hospitals for over 30 years. It contours to snuggly fit the ankle, wrist, and even thigh. Its long closure strap assures a secure and comfortable fit even during the most strenuous exercise program. It features heavy-duty materials and double-stitching throughout. The Cuff® exercise weights are color-coded, marked with both pounds and kilograms and have grommets for hanging on any peg-board weight rack. Available from ¼ to 25 pounds, individually or in sets. 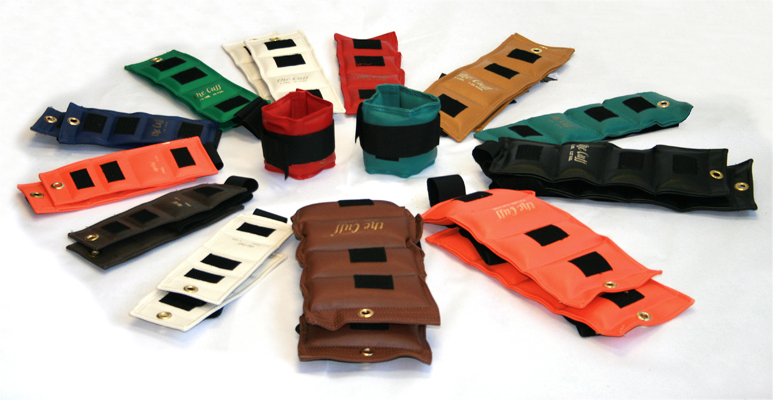 The Cuff® Original Ankle and Wrist Weight (7 Piece Set - 1 each 1, 2, 3, 4, 5, 7.5, 10 lb) has been proven effective in hospitals for over 30 years. It contours to snuggly fit the ankle, wrist, and even thigh. Its long closure strap assures a secure and comfortable fit even during the most strenuous exercise program. It features heavy-duty materials and double-stitching throughout. The Cuff® exercise weights are color-coded, marked with both pounds and kilograms and have grommets for hanging on any peg-board weight rack. Available from ¼ to 25 pounds, individually or in sets. 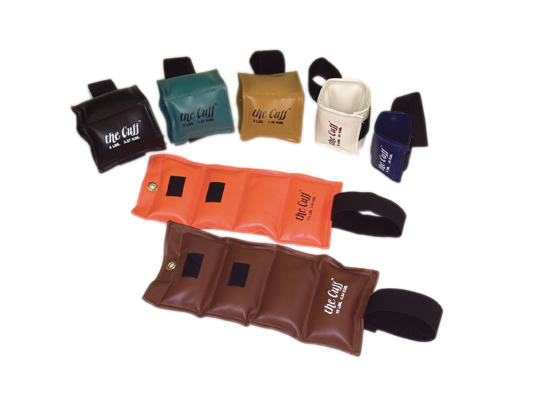 The Cuff® Original Ankle and Wrist Weight (7 Piece Set with Rack - 1 each 1, 2, 3, 4, 5, 7.5, 10 lb) has been proven effective in hospitals for over 30 years. It contours to snuggly fit the ankle, wrist, and even thigh. Its long closure strap assures a secure and comfortable fit even during the most strenuous exercise program. It features heavy-duty materials and double-stitching throughout. The Cuff® exercise weights are color-coded, marked with both pounds and kilograms and have grommets for hanging on any peg-board weight rack. Available from ¼ to 25 pounds, individually or in sets. 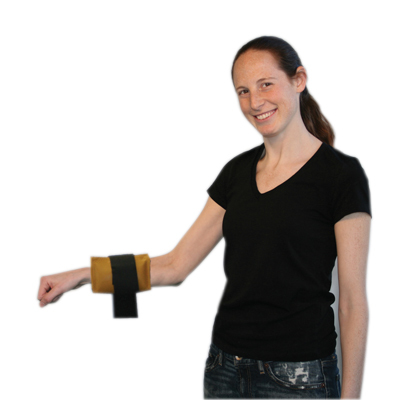 Dimensions: 7" x 48" x 26"
The Cuff® Original Ankle and Wrist Weight (20 Piece Set - 2 each .25, .5, .75, 1, 1.5, 2, 2.5, 3, 4, 5 lb) has been proven effective in hospitals for over 30 years. It contours to snuggly fit the ankle, wrist, and even thigh. Its long closure strap assures a secure and comfortable fit even during the most strenuous exercise program. It features heavy-duty materials and double-stitching throughout. The Cuff® exercise weights are color-coded, marked with both pounds and kilograms and have grommets for hanging on any peg-board weight rack. Available from ¼ to 25 pounds, individually or in sets. Dimensions: 16" x 24" x 24"
The Cuff® Original Ankle and Wrist Weight (20 Piece Set with Rack - 2 each .25, .5, .75, 1, 1.5, 2, 2.5, 3, 4, 5 lb) has been proven effective in hospitals for over 30 years. It contours to snuggly fit the ankle, wrist, and even thigh. Its long closure strap assures a secure and comfortable fit even during the most strenuous exercise program. It features heavy-duty materials and double-stitching throughout. The Cuff® exercise weights are color-coded, marked with both pounds and kilograms and have grommets for hanging on any peg-board weight rack. Available from ¼ to 25 pounds, individually or in sets. 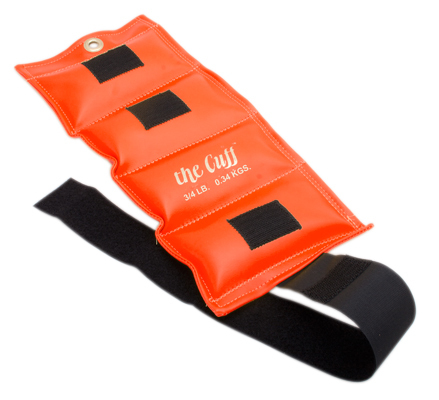 The Cuff® Original Ankle and Wrist Weight (24 Piece Set - 2 each .25, .5, .75, 1, 1.5, 2, 2.5, 3, 4, 5, 7.5, 10 lb) has been proven effective in hospitals for over 30 years. It contours to snuggly fit the ankle, wrist, and even thigh. Its long closure strap assures a secure and comfortable fit even during the most strenuous exercise program. It features heavy-duty materials and double-stitching throughout. The Cuff® exercise weights are color-coded, marked with both pounds and kilograms and have grommets for hanging on any peg-board weight rack. Available from ¼ to 25 pounds, individually or in sets. 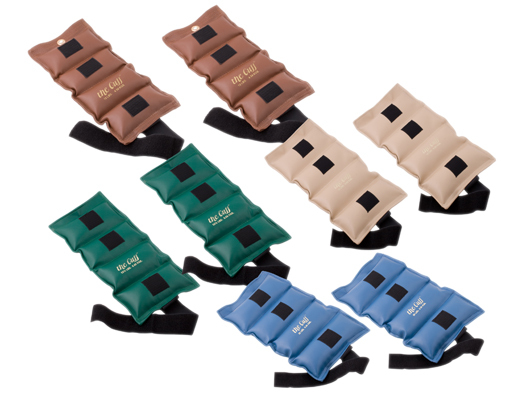 The Cuff® Original Ankle and Wrist Weight (24 Piece Set with Rack - 2 each .25, .5, .75, 1, 1.5, 2, 2.5, 3, 4, 5, 7.5, 10 lb) has been proven effective in hospitals for over 30 years. It contours to snuggly fit the ankle, wrist, and even thigh. Its long closure strap assures a secure and comfortable fit even during the most strenuous exercise program. It features heavy-duty materials and double-stitching throughout. The Cuff® exercise weights are color-coded, marked with both pounds and kilograms and have grommets for hanging on any peg-board weight rack. Available from ¼ to 25 pounds, individually or in sets. 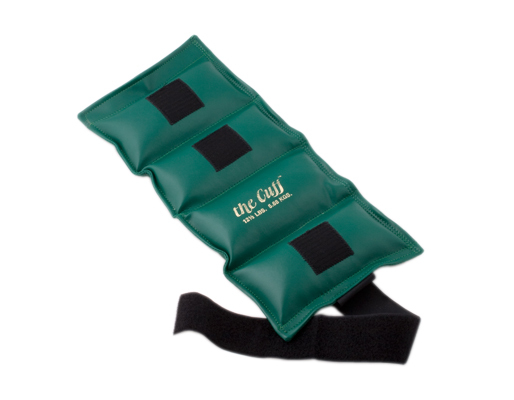 The Cuff® Original Ankle and Wrist Weight (32 Piece Set - 2 each .25 - 10 lb) has been proven effective in hospitals for over 30 years. It contours to snuggly fit the ankle, wrist, and even thigh. Its long closure strap assures a secure and comfortable fit even during the most strenuous exercise program. It features heavy-duty materials and double-stitching throughout. The Cuff® exercise weights are color-coded, marked with both pounds and kilograms and have grommets for hanging on any peg-board weight rack. Available from ¼ to 25 pounds, individually or in sets. The Cuff® Original Ankle and Wrist Weight (32 Piece Set with Rack - 2 each .25 - 10 lb) has been proven effective in hospitals for over 30 years. It contours to snuggly fit the ankle, wrist, and even thigh. Its long closure strap assures a secure and comfortable fit even during the most strenuous exercise program. It features heavy-duty materials and double-stitching throughout. The Cuff® exercise weights are color-coded, marked with both pounds and kilograms and have grommets for hanging on any peg-board weight rack. Available from ¼ to 25 pounds, individually or in sets. The Cuff® Original Ankle and Wrist Weight (8 Piece Set - 2 each 10, 12.5, 15, 20 lb) has been proven effective in hospitals for over 30 years. It contours to snuggly fit the ankle, wrist, and even thigh. Its long closure strap assures a secure and comfortable fit even during the most strenuous exercise program. It features heavy-duty materials and double-stitching throughout. 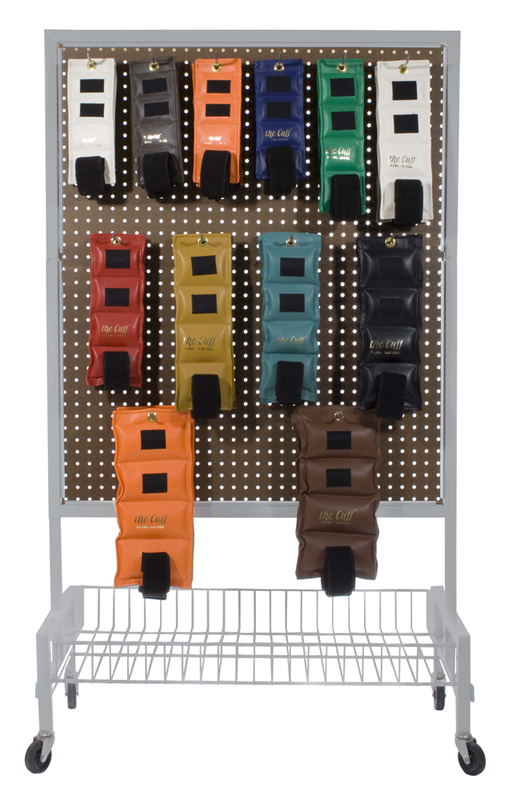 The Cuff® exercise weights are color-coded, marked with both pounds and kilograms and have grommets for hanging on any peg-board weight rack. Available from ¼ to 25 pounds, individually or in sets.